This is another Asian sweet bread prepared with Tangzhong Starter - Water Roux Starter via Starch Gelatinization. They are so good that I have at least baked a dozen times. For the filling, besides coconut paste, nutella, or peanut butter would work great too. Dissolve sugar with warm milk in a mixing bowl. Sprinkle dry yeast over and set aside for 10 minutes. Add in flour, milk powder, egg and the starter. Stir at low speed for 1 minute until all the ingredients combined. 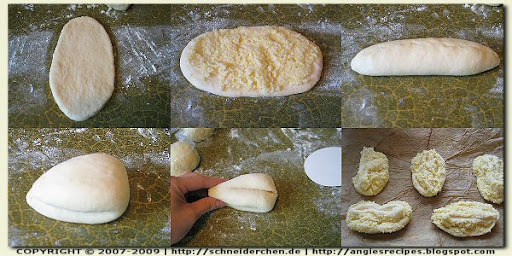 Increase to medium speed and continue kneading until the dough has become a soft and elastic ball. Adjust the speed to low. Stir in salt and butter until all incorporated. Increase the speed to medium again and knead until the gluten has developed. Take dough out and round it up into a ball. Place it in a lightly greased bowl and cover it with a plastic wrap. Set aside and proof in a warm place in the kitchen until the dough has doubled in bulk, about 1 hour. Degas the dough and divide the dough into 8 small even portions. Round up and set aside, covered with a plastic wrap, for 10 minutes. To prepare the filling by whipping castor sugar, vanilla sugar and butter until well-combined. Gradually add in egg, coconut shreds and evaporated milk. Set aside for 10 minutes until all milk has been thoroughly absorbed by coconut shreds. Place dough balls on a lightly floured work surface. With seam side down roll each dough into an oval. Turn and spread about 30 grams of coconut filling over the top. Roll up, starting at long side and seal. Fold the roll into a half. Bring the open edge towards yourself and make a slit lengthwise at the other side of the dough. Gently twist dough open and place it on a baking tray lined with a parchment paper. Let rise for about 45-60 minutes. Brush with egg wash and sprinkle some pine nuts over. Bake in a preheated 175C/350F oven for about 18 minutes until golden brown. Except butter and cranberries, place all the dough ingredients in a mixing bowl. Mix with dough hook at slow speed for 1 minute. Switch to the medium speed, and continue to knead until a dough forms. Add butter gradually and beat until gluten is fully developed, i. e. elastic and smooth. Add in cranberries and mix at slow speed until combined. Place the dough in a lightly greased bowl, covered and leave in a warm place for about 1 hour until the dough has doubled in size. Divide the dough into 6 even portions, round up and rest for about 10 minutes. 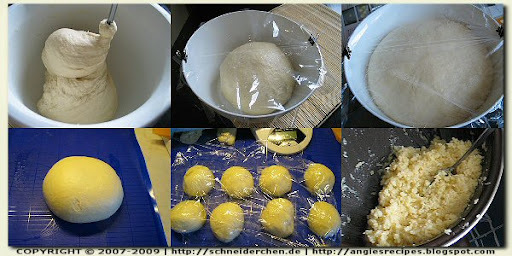 Press down each dough to release gas and roll out at about 30cm long, roll up. Place 3 rolled dough in each lightly greased loaf pan and cover loosely with a towel. Leave to rise for about 40 minutes. After rising, brush the dough with egg wash and bake in a preheated 175C/350F oven for about 30 minutes. Line a loaf pan with tin foil and generously grease the bottom and sides with corn oil. Set aside. Place sugar and tomato juice in a saucepan. Cook the mixture over the medium heat, stirring constantly, until sugar dissolves and mixture just begins to simmer. Stop stirring. Continue to cook the mixture over medium heat until it reaches 120C/240F. Turn the heat off, then stir in the butter until well incorporated. Turn the heat back on, continue to cook over medium heat until the thermometer reads 125C/250F, the firm ball stage. Remove from heat immediately and set the pot aside to cool for a few minutes. Pour into the prepared loaf pan and cool until set. Cut into rectangles and wrap with baking paper. Store the caramels in an airtight container for up to 2 weeks. Stir together flour and baking powder. Beat together the butter and sugar until light and creamy. Gradually add in the egg and beat until well-combined. 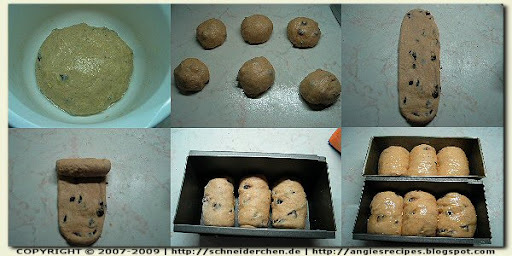 Shape dough into 1-inch balls and place 2 inch apart on the tray lined with a baking paper. Lightly flatten them with a spoon. Bake in the middle part of the preheated 175C/350F oven for about 18-20 minutes. Remove to wire racks and cool completely. Dip with the chocolate glaze. 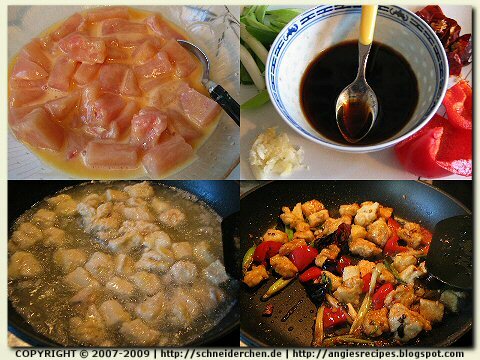 ©angiesrecipesin German and 虹鳟鱼in Chinese. Clean the fish and drain. Mix in the marinade and let stand for about 15 minutes. Rinse peppers in cold water and then remove stem and seeds. Cut into small chunks. Combine all the sauce ingredients in a small bowl. Heat some oil in a heavy pan until hot. 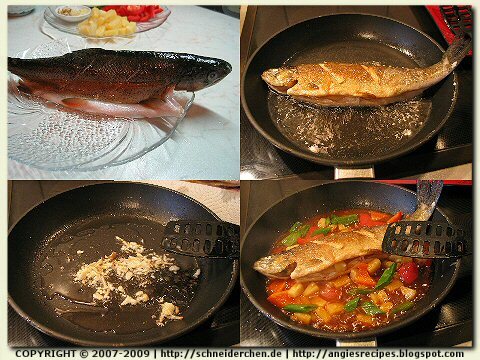 Gently lower in fish and pan-fry until golden on each side. Drain on a kitchen towel and set aside. Leave 1 tablespoon of frying oil in the pan and add in minced garlic and ginger root slices. Stir until fragrant and add in red pepper and prepared sauce. Stir well. Return the fish to pan, and add in pineapple chunks and spring onions. Cook for about 1-2 minutes and dish off. Pulse the dry roasted peanuts in a blender until it resembles coarse crumbs. Pour into a bowl and mix with sugar. Set aside. 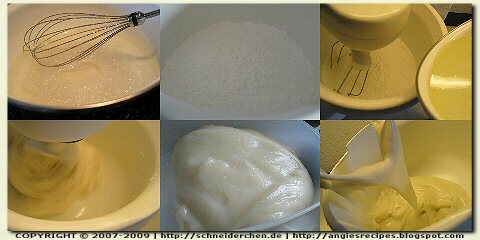 Place the glutinous rice flour in the bowl of your stand mixer. Combine water and sugar in a medium saucepan and bring to a boil over medium-high heat. Reduce to a simmer and cook, stirring, until sugar is dissolved. Add in oil and stir to combine. Pour the liquid into the glutinous rice mixture and stir on the slow speed until all flour is incorporated. Increase the speed and stir until the rice dough is smooth. Transfer it into a bowl and steam over boiling water for about 10 minutes over high heat. ©angiesrecipes in the center of pinched dough, fold the edge to seal the mochi and coat lightly with the peanut mixture. 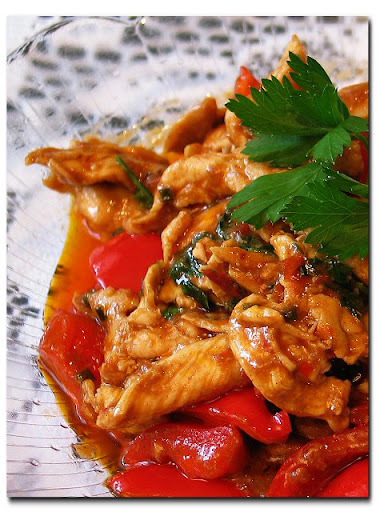 This is a quick, spicy and flavourful chicken dish made with the ready-made Lee Kum Kee Ma Po sauce, and best served warm with steamed white rice. Clean the chicken breast and slice them thinly. Add in salt, egg white and cornstarch. Cut the spring onions into chunks and the bell pepper into pieces. Heat up a wok with oil, stir in the sliced chicken. Add in the spring onions, bell pepper pieces and Mapo sauce. Stir until all the ingredients are well-combined and cooked. Needless to say, these cookies are a true treat for any chocolate lovers, but they are so darn sweeeeeeeeeet.....that would even satisfy the utmost sweet-tooth craving. Except that, I can't really complain having these caramel bars with a couple of glasses of bone dry sparkling Riesling in the afternoon. Preheat oven to 180C/350F. Spread the almond on the baking tray and bake for 10 minutes until they are fragrant. Remove, cool and roughly chop the baked almond. Line a 28cm square baking pan with baking paper and grease the paper with butter. Beat butter and brown sugar on medium speed until pale and fluffy, about 3 minutes. Add flour and salt, and beat until just combined. Press dough evenly into pan, and bake until lightly browned, about 30 minutes. Remove and set aside. Cut the chocolate into the smaller chunks and place in a medium bowl. 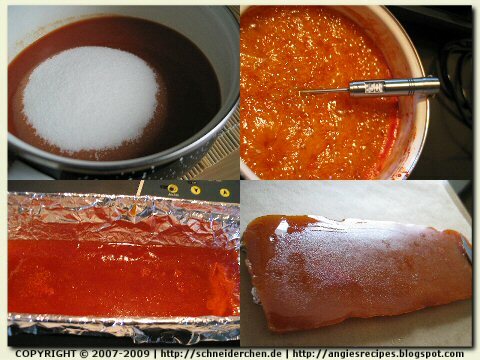 Heat granulated sugar and water in a small saucepan over medium heat until amber, 10 to 12 minutes. Remove from heat. Add butter, cream, and salt. Bring the mixture to a boil, stirring until smooth. Cool briefly. Pour over chocolate. Let stand for 2 minutes. Stir to combine, and let stand until cool, about 10 minutes. Pour mixture over crust. Sprinkle the chopped almonds on top. Chill at least 4 hours, or overnight. Cut into 24 bars. 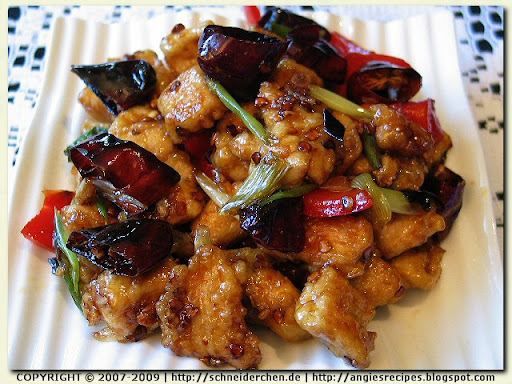 General Tso's Chicken is not really a Chinese dish, but actually an American creation. 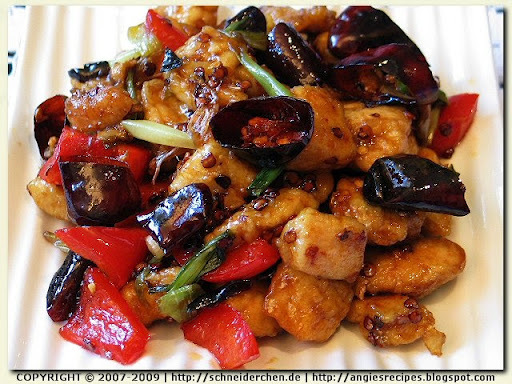 It is a sweet deep fried chicken dish served in American Chinese restaurants. Rinse the chicken breast and pat dry with kitchen paper. Cut into the inch dices and place them in a bowl. Add in salt, egg and 1 tablespoon of cornstarch. Stir until well mixed and set aside for 20 minutes. Mix the ingredients for the sauce in a small bowl and save for the later use. Fill a large skillet with enough oil and heat until very hot. Coat the chicken dices with cornstarch and deep-fry until golden and crispy. Drain on paper towels. Leave a small amount of oil in the same skillet and heat until hot. Stir in garlic, chillies and spring onion chunks. Stir-fry briefly. 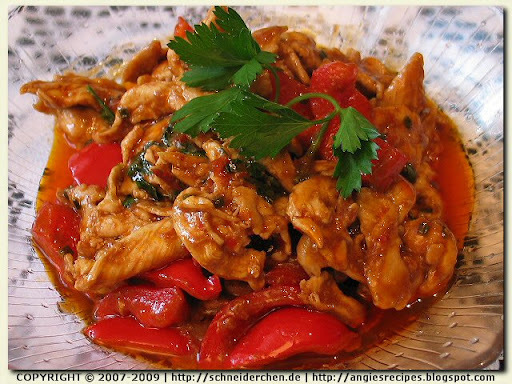 Return the chicken, bell peppers to the skillet and pour the prepared sauce over. Stir until all well combined. Remove and serve with steamed rice.